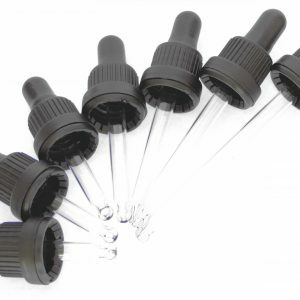 High quality glass dropper/pipette assemblies, manufactured to precise specifications for use with moulded glass bottles and tubular glass vials. 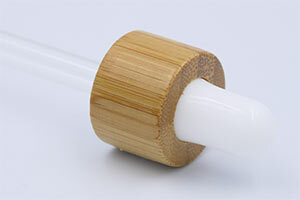 The pipettes are manufactured from low borosilicate glass and can be supplied with various different nozzle types such as ball end or tapered tip. 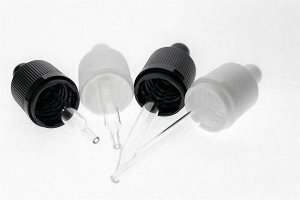 The caps are produced from durable Polypropylene (PP) available in various colours and are either tamper evident or straight screw thread. The bulb or teat is produced from either white or black silicon or natural rubber. 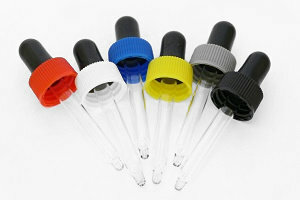 We also offer pipette/dropper assemblies with child resistant type (CRC non-certified), tamper evident (T/E) and combined CRC & T/E caps in various colours.